Patty and I arrived Thursday (7/28/11) afternoon at the campsite. Thanks to the GPS coordinates and ED4 signs, we found the campground easily. 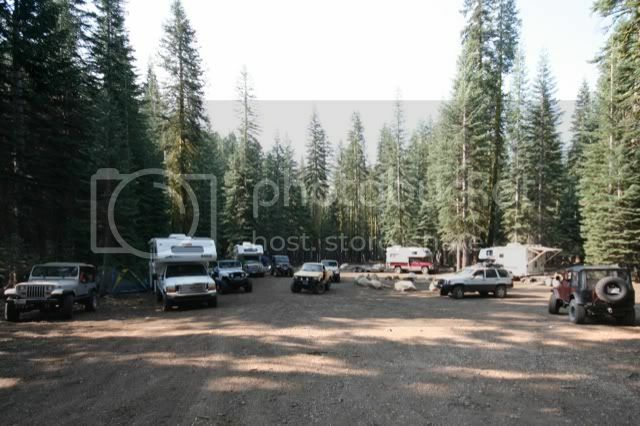 Some members had already arrived, but Ole was at the campsite making sure that we had the space we needed. After setting up our tent / site, we walked around to introduce / greet those members at the campground. Dave came over and introduced himself and gave us a run down of the events to occur. As prospectives, we felt quite comfortable. After dinner, we walked over to the group campfire and joined in the "party". We finally called it quits about 10 pm. Friday morning was the start of the trail maintenance work. The forest rangers were on hand to give up a pep talk and explaining the forest service guideline's and new trail maps (someone mentioned that they should have brought their decoder ring to decipher the map... true). We broke up into 2 groups, one for Mattley Ridge trail (leader was Dave) and the other for Corral Hollow trail (leader was Jason). The Mattley Ridge crew consisted of Dave and Loro (& Alpine), Ole and Sherry, John and Hope & family, Mike and Reynosa, Gary and Marlene (& Molly), and Chris and Patty. 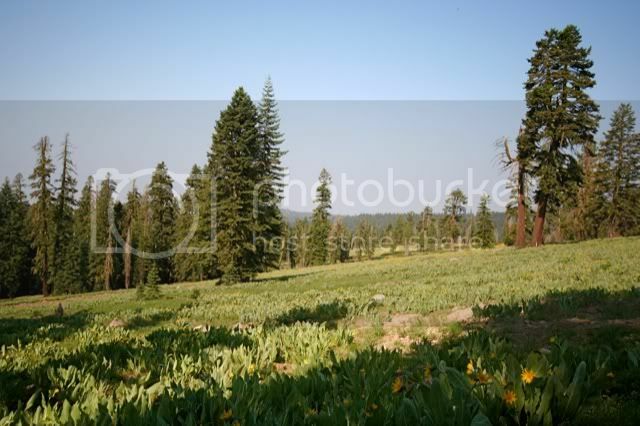 We followed the trail up to the ridge then took the right fork of the trail at the &quot;hunters&quot; staging area (?). Then the fun began. Our 1st tree was cut up to reveal a snow bank. We got thru this one easily enough, but then came the next snow bank. There was a LOT of snow to move. Everyone worked real hard to get it down to a level where the vehicles could get through. All in all, I think we cut up 10 or 11 trees (Ole had the BIG saw, while John and I had smaller ones) and dug out 4 snow banks (We destroyed at least one shovel). By the time we hit the bottom of the trail, the only thing anyone wanted to do was get back to camp. And that's what we did, very quickly I might add. Dinner that nite consisted of a Taco Dinner. Everything tasted great! It was great seeing 2 empty tables all of the sudden get filled with a large quantity of food. Rumor had it that Jason held the record with 4 taco's. The desert was two types of ice cream and some pie, cookies, and brownies. Thank you Dave for organizing this. After dinner, people sat around the campfire and talked about the day's events and jeeping in general. Since the Mattley trail hadn't been finished, it was decided to finish it up on Saturday. We finally agreed (reluctantly) on a start time of 7:30 am. Saturday we hit the tail around 8 am. We broke up into two groups again. Dave's group (w/ John & Shane, Chris & Patty, Ellen &Loro) took the upper ridge trail while Jason's group headed lower. After a nice climb to the top of a ridge, we decided to clear an extra trail. Chain saws made quick work of a small tree. At the junction of another road, we turned around and headed back to the last trail junction and continued on the Mattley trail. We eventually came to a 30&quot; plus log crossing the gravel trail. A bypass had been made around the log in the soft dirt. It was decided that we should clear the trail and close off the bypass. John's chainsaw and my chain saw were not long enuf to cut clear through the log in one cut, so it was done in stages. Eventually, we made two cuts clearing the log off the trail. John's chain saw got stuck in the log when the weight of the log shifted. We managed to use 2 hi-lift jacks to re-position the log and allow the chain saw to be pulled out. 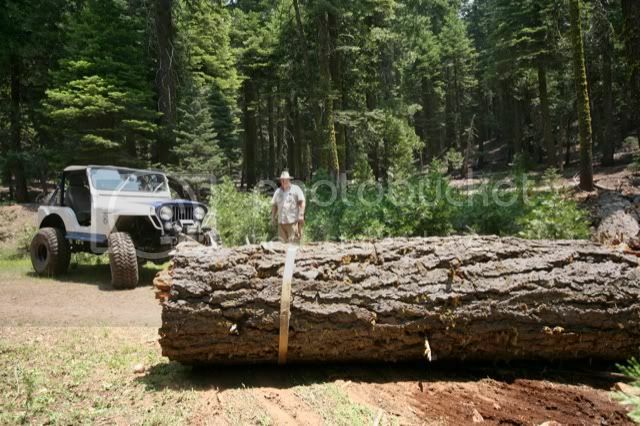 Since the log was so huge and heavy, we winched 2 sections out off the road. It was gratifying to see some ATV's use the newly cleared trail shortly thereafter. After lunch on the trail, we returned to the campground. We met up with Gary & Marlene, Vidas, Mike & Reynosa to determine if we were going to run slick rock. 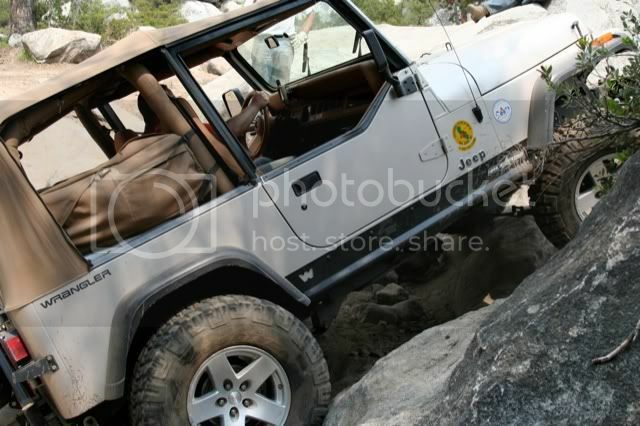 I was concerned about the trail since I was running stock tires, but everyone assured me that I would be fine. After some discussion, Dave, Loro (& Alpine) and I decided to go ahead with the run. We drove up to Bear Valley and gassed up. We then proceded to the trail head. All in all, I didn't find the trail to be too difficult. While I made bottom contact several times and scraped some paint off my driver side fenders (and rock rail), I got thru the run pretty good. After the run, we aired up near the main road and returned back to camp. Vidas and Dave had to leave, but Gary, Marlene, Ellen, and Loro remained and we all had a great shared dinner that evening. Everyone packed up and left Sunday morning. Thanks to everyone at the campout and the trail run. Patty and I had a great time. See you all at the next meeting. Sunday, June 28:CJ & Susanna, Dennis Holler & Ava Moore, Loro, Sierra & Alpine Valarie & Rick Arnesen, & Moke. (Sorry if I got the name wrong? I was not very awake this morning) Met at the Corral Hollow trail head at about 9:30am, and ran the trail up to Bear Valley by about 12:30 with a stop for a short hike to the high point. The trail is completely open, with easy passage through the snow banks. I'm happy to report the Grand Cherokee is gone. Also, I got a photo of a fungus I've never seen before, even in the mycology books. Looks like a white ball with spikes on it! If anyone knows mushrooms, let me know and I'll send a photo. Thanks to Sherry for organizing the trail opening! Hello All, Here's a trip report for the Saturday and Sunday runs. This was the first time for Ava and I to run any of these trails and it was an awesome weekend to do them. Actually, neither Ava nor I had ever been to the Horse Gulch campground so before we checked into the Lodge we drove in to see where it was on Friday evening. We found Ellen and Connie already set up in camp and talked to them for awhile, then went into Arnold for the evening. Run #1: Early Saturday morning (8AM!) 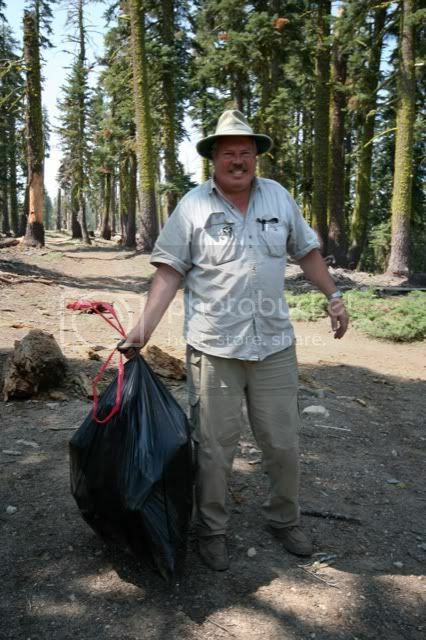 we all met back at camp to start out on the Mattley Ridge trail for cleanup. (Others have listed the participants). Ellen led us through both loops of the trail. Mostly it was cleaning up debris, but we did move some branches around to detour around a bypass due to a fallen log. None of us had a chainsaw, so that's the best we could do at the time. It had been a long day so we all dispersed to relax for the evening. Run #3: So, three runs in two days! I had heard quite a bit of talk about Slickrock and have wanted to try it for a long time. 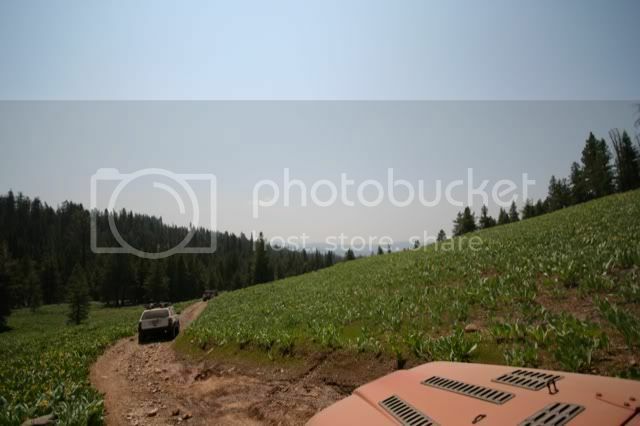 After we had lunch, Ellen headed for home and the Arneson's made a Toyota sandwich with their CJ's on the trail. 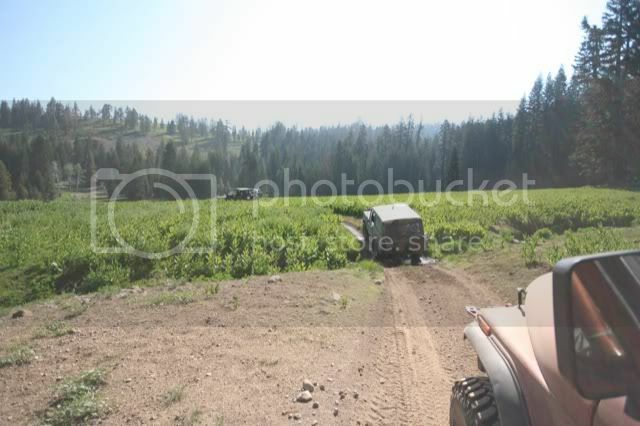 This was an awesome trail, and showed me that I had made some good choices on the mods to the 4Runner. I had no problems running this trail and got considerably less damage than the Deer Valley run several years ago. I broke in the sliders!!! 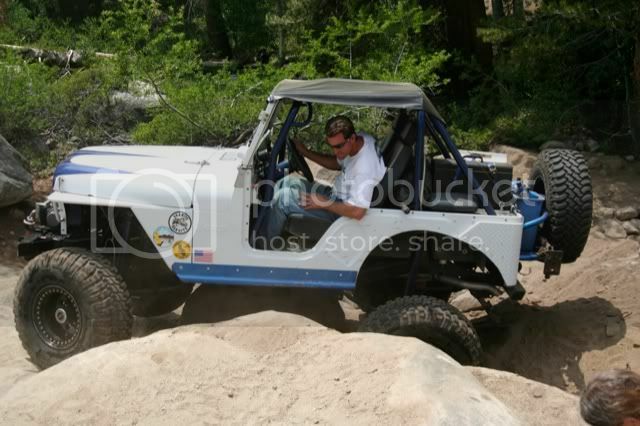 The lockers worked great and the crawler gears really made the going much easier. Below is a link to a picture of CJ guiding me up the stair step at the end of the trail. I had a wonderful time all weekend. 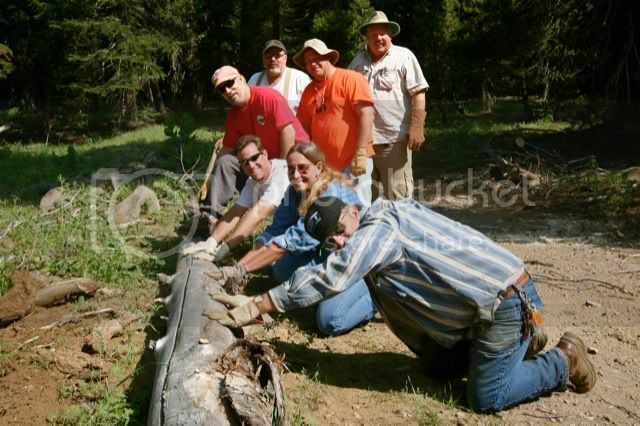 Hi All, Just wanted to send out give out a big "Thank you" for all the voluneers who worked on the Adopt-a-trails for both the Mattley Loop Ridge and Corral Hollow trails. 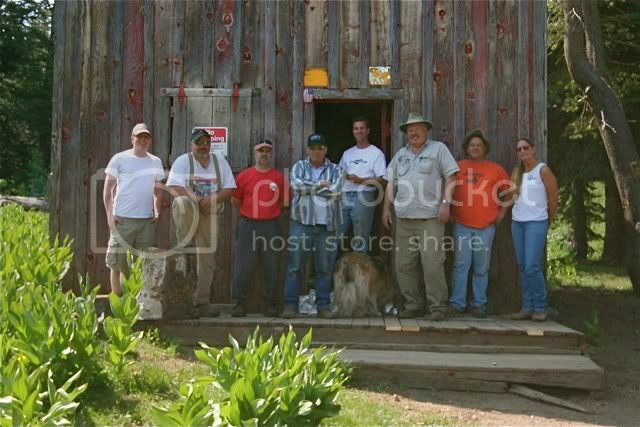 Just this Saturday, June 27, Ellen lead the group of us to open or finish opening the Mattley Loop Trail. Jason and his group did a great job the prior weekend. Thanks Jason for the great e-mail. * Carlos Fuchen and his family. This year on the Corral Hollow Trail offered up lots, I mean lots of snow. We did encounter 3 downed trees, one really large one, that had fallen against itself, accross the trail and empaled another tree on the opposite side of the trail. It was something to see. This downed tree offered our chainsaw guys (Jason & Ole) a slight challenge, but with the help of their chainsaws, lots of winching, the downed tree didn't have a chance. Jason, Jim, Tom & Jim Vella, Mike P., Chris and Ron did run the Mattley Loop Ridge trail, or most of the trail on June 18. Thanks a bunch for all that tree clearing. ED4, As Sherry mentioned, 9 of us (Ole, Sherry, Jim O., Tom V., Mike P., Ed, Ron, Chris, and myself) opened the Corral Hollow Trail on Thursday. A couple very large trees across the trail, one suspended 6+ feet in the air resting on a 8" diameter tree, and 4-5 feet of snow made this one of the toughest years by far. Everyone pitched in and we had the trail cleared by 4pm. With our goal completed, we decided to tackle the Mattley Loop Trail on Friday. We ( Tom V., Jim O., Jim V., Mike P., Ron, Chris, and myself) met with Lonnie at 8:30am to give him an update on the trails and then we went to work. We began on the "tree side" of the loop, as opposed to the "snow side". Only 1 large 40" diameter tree (I know this because my 3' bar did not cut all the way through) and a handful of smaller trees across the trail. We flew through the first section and made it to the 7N-09 intersection in less than an hour. We proceeded down the rocky section and missed the right turn down the hill to the steep off-camber section of the trail. The trail that we were on was well traveled and very nice. This was a new trail for everyone there. It led us to a gravel road and we turned right to get back to our original trail. We quickly found the bottom of the steep, off-camber section and headed up it. That was a blast. All of the drivers got real serious going up that hill! We had a few more trees to clear and we popped back out on the main trail and headed back to the 7N-09 intersection for lunch right around noon. After lunch we decided to tackle the "snow section" from the bottom up. Nobody ever claimed that we were rocket scientist!! After a 15 minute dusty cruise down the gravel road, we headed up the trail. I just need to say, the meadows up there right now are really breath taking!! 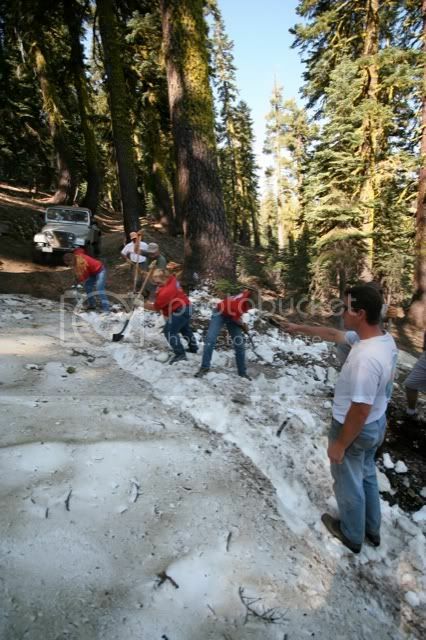 After a leisurely drive up the trail, crossing the meadow, we ascended to the first of 4 big snow drifts. Everyone grabbed a shovel and we cut a trench to keep our vehicles on the trail. 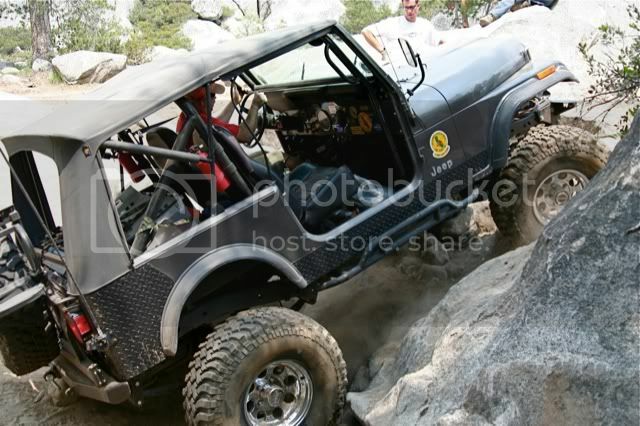 Jim O. was the lead and had to winch through to break trail. From that point, everyone else strapped each other through. This continued as we slowly progressed up the trail. It was a lot of work, but everyone had a smile on their face. We cleared the top of the hill around 2:45pm and headed back to camp to clean up and head home. Wow, what a fun 2 days. I arrived at Horse Gulch campground on Wednesday night. I had the whole place to myself until about 11:30 pm or so when Jason, Jim, Ron and Mike arrived. The next morning after everyone was fed and rigs were prepped we headed out to begin the opening of the Corral Hollow trail. In addition to Jason, Jim, Ron, Mike and myself were Tom V, Ole and Sherry. It was pretty uneventful until after the cabin. We found a couple of trees that needed to be cut up, so out came the chainsaws. Ole and Jason made short work of the trees and the rest of us pushed them out of the way. A short time later we came to an area that usually has some snow in June and boy did we find snow….and a very stuck and abandoned Jeep Grand Cherokee. The Grand was blocking the trail so with a little digging and a tow strap it was soon moved to the side so that we could attempt to continue on. 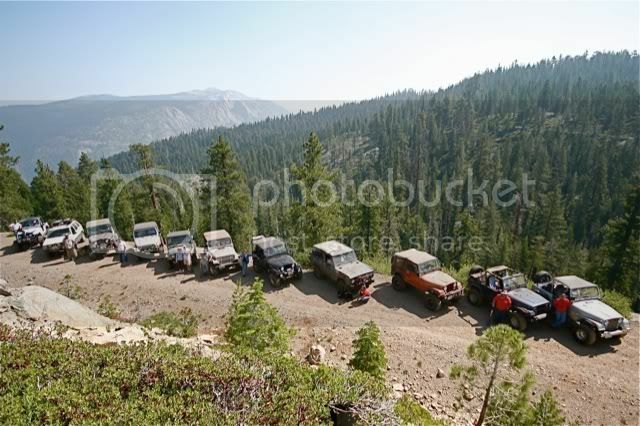 It was tough going getting past the first couple hundred or so feet, but with Jim’s and Tom’s winches everyone was through in short order. We came across a little more snow up at the top which turned out to be not much of a problem and then we stopped for lunch at a spectacular view spot. After lunch we began our descent towards Hwy 4, but soon came across a huge fallen tree that was suspended above the trail. 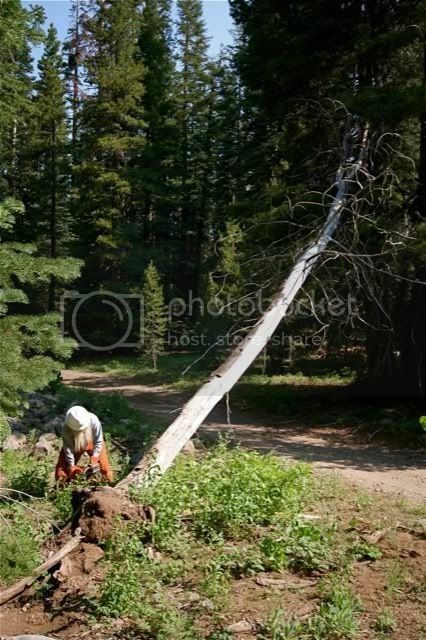 It was an extremely dangerous tree to remove, but after much discussion and planning the group managed to lower the tree to the ground, cut it up and move it without any injuries. The remainder of the journey was uneventful. Day 2 was the Mattley Ridge Trail. We had 4 rigs with me, Jason, Jim, Mike, Ron, Tom and his brother Jim in attendance. We decided to start out on the side that we knew would not have snow. Actually, there was very little that needed to be done. 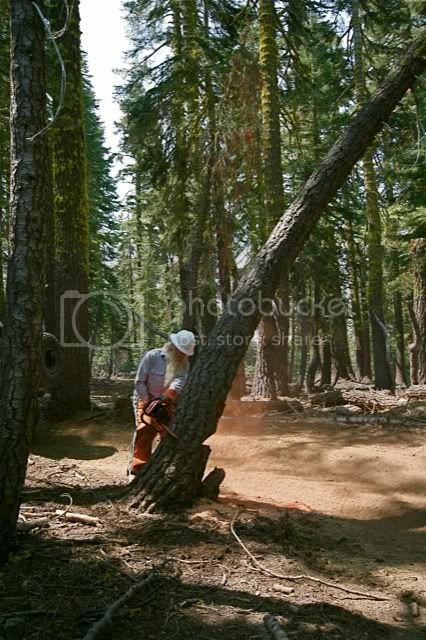 I believe we had to cut one fairly large tree early on and then drag a few smaller ones out of the way. I guess at some point we missed a turn that would have taken us onto a difficult steep off-camber trail. So, we ended up on a trail that was new to me. It was very tight in spots but not too challenging. Eventually we ended up on a gravel road that we thought might take us back to 7N09, but in actually put us at the bottom of the steep off-camber trail. So, of course we decided to go up it. That was very cool. The off-camber stuff definitely keeps my attention. Couple that with some really tight spots, very steep climbs with a poor traction surface and you have some serious fun. We have to do that again. After that excitement we stopped for lunch. After lunch we decided to tackle the other side of the trail from the bottom up. Gravity was not helping us. We shoveled, winched and strapped our way to the top with Jim leading the way. It was epic. In the end the trail was opened at we headed back to Horse Gulch to pack and head home. A hot shower was waiting. Ole and Sherry, could you please forward this link to Lonnie? Have a geat 4th everyone!! Name: CJ ArnesenDate: 6/27 - 6/28/08 Location: Adopt-a-Trail 7N09 off of HWY 4 and more Trail Boss: Jason Green Attended Friday by: Jason Green, Jay Lohr, Tom Vella, Ed Lorenzen, Chris Mains, Sherry Stortroen, CJ Arnesen, Jim Hodges and Ole Stortroen. Attended Saturday by: Chris Mains, Jay Lohr, Jason Green, Tom Vella, Ellen Layendecker, Jim Hodges, Brian McMinn & Thu Doung, Rick & Val Arnesen, CJ Arnesen, Loro Paterson, Darell Kroeker & Lynn Warkentin & Bob Atchison, and Sherry Stortroen. I drove up late thursday night after some last minute Jeep repairs. My family has a cabin in Dorrington about 25 min away from the camp site at Horse Gulch so I slept there Thursday night and drove into camp Friday morning. We left promptly at 9am. A shot of the camp. we headed out on Corral Hollow Trail. Not being much more manual labor we used gas powered chain saws and gas powered pulling devices. And then we posed like we actually worked. 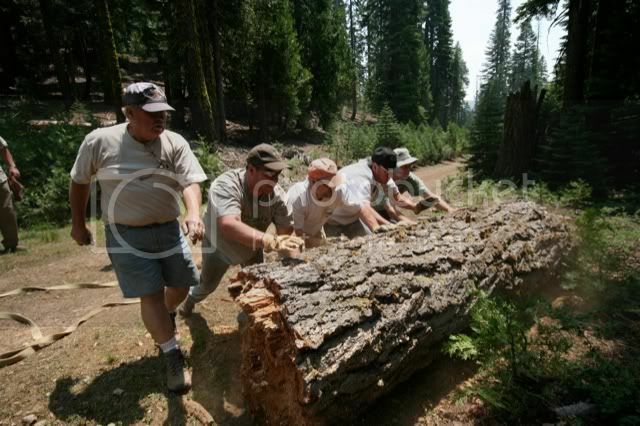 I’m kidding, Ole got a good workout using the chain saw, and everyone pitched in to help roll trees out of the trail. However it is fun to use our "toys" to do some of the work. 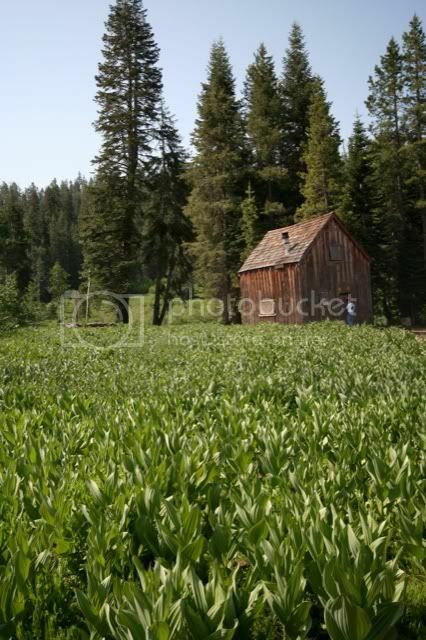 We came to a beautiful meadow where this old hunting shack sits. 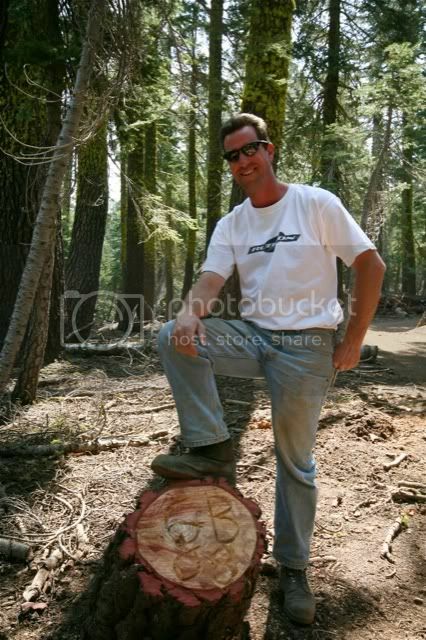 Jason took time to carve "GB 08" - Granite Bandits 2008 and pose. We finished Corral Hollow and decided to go into the Slick Rock trail via Lake Alpine and have some lunch. I was too busy eating and didn’t take any photos. After lunch we drove the rest of the trail to the "stairstep" obstacle. The photos below try to describe each person’s attempt up in only one photo. Jason, Hard line, VERY high centered. Tom, good line, lifted a tire, drove right up. 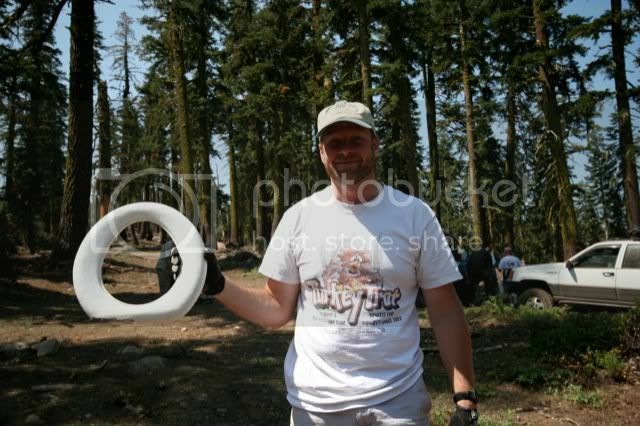 Chris, spun a few tires, but crawled right up, and was very stoked that he made it. I bounced my way up with little finesse. Ed crawled right up it, like it was a speed bump in a shopping mall. Jim, he gets two photos. 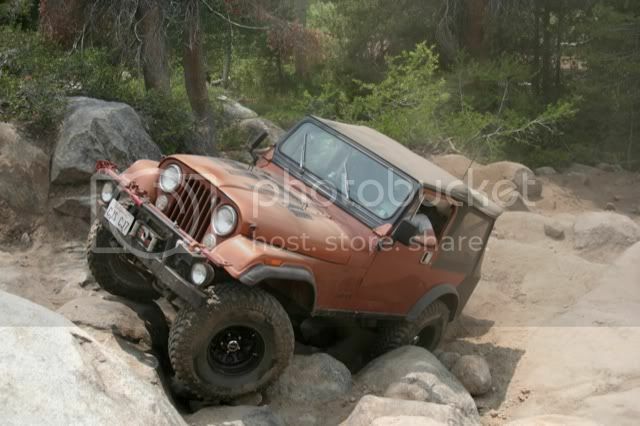 One showing some good articulation and . . .
one showing the very odd situation he got himself in. 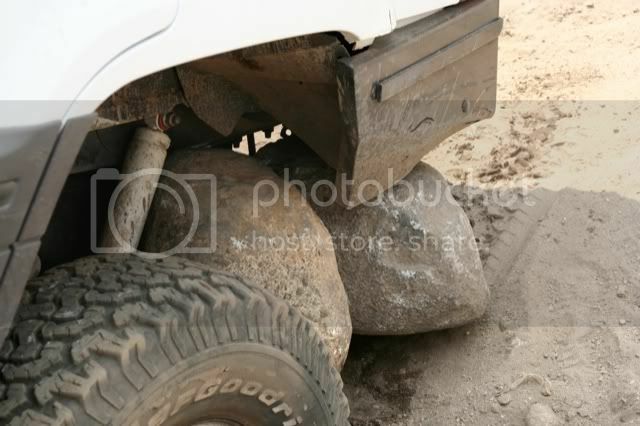 Two rocks jammed up between tire, gas tank, and shock. The picture doesn’t show it, but they were VERY stuck and actually pushing his tire in about 4inches. Jason needed some revenge after getting high centered so he took a second CRAZY line over the left of the obstacle. Just in case you need help while on the Slick Rock trail the locals have devised a Hillbilly Cellphone in case of emergencies. 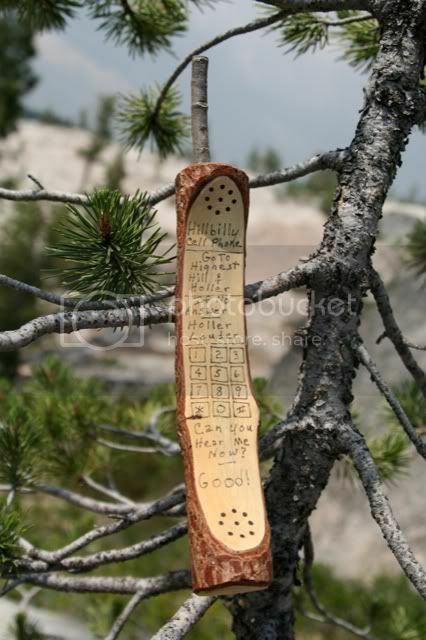 It says "Hillbilly Cell Phone, Go to Highest Hill and Holler, If No answer Holler Louder, NumPad, Can you hear me now?, GOOD!" Friday night I camped, first time in about 7years I believe. It was nice, but I was jealous of the campers/showers/stoves/beds. Someday when I’m older and have paid my dues I’ll live a life of luxury. Saturday morning my parents joined the fun. They brought along my dog Mokey, and some edible goodies to share. Saturday, more people, more fun. We found some snow on the Mattley Loop Trail. Jason took charge. A picture making sure everyone got credit for working. Some more beautiful views while driving. Jim with a full bag. 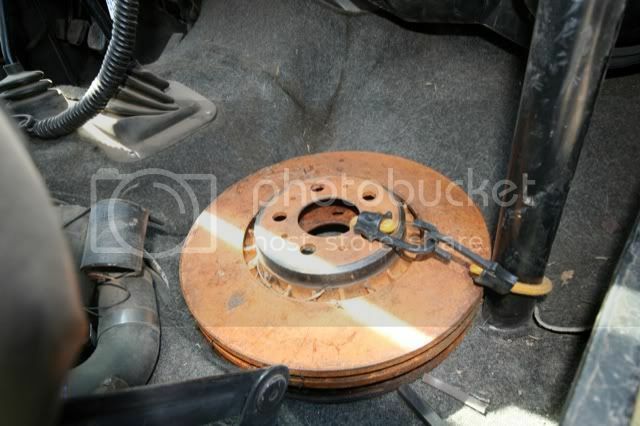 Tom took home some Volvo brake rotors. Lucky Jason found a very nice flash light while "exploring" a bit. One of our last logs. Quite large, but thankfully rotten. Jason pulled it over to the side. In proper ED4 spirit people jumped right in to roll it out of the way. What a fun trip, thank you. It was great to explore new parts of an area where I have grown up. Also it was great to be a part of keeping these trails open. ED4, Thank you Sherry for being the “Scribe” this past weekend and thanks to all who participated!! We had a great weekend of work and play!! Ole maned the chain saw on Friday and I took care of a few small trees on Saturday. CJ documented the entire event with 200 plus photos. Watch out Ira, I think you have some competition. CJ’s mom, Val, kept everyone’s appetite in check with homemade banana bread and cookies. Jim kept us entertained with his nigh-time laser light show. I was even lucky enough to find a nice G&P Tactical Flashlight while cleaning up the garbage left behind someone’s shooting spree. Friday we completed the Corral Hollow Trail by 12:15pm and we headed up the road to do the Slick Rock Trail and have lunch by the river. The weather was great and the smoke was not as bad at the higher elevations. The trail ride was fairly uneventful until we got to the stair-steps at the end. 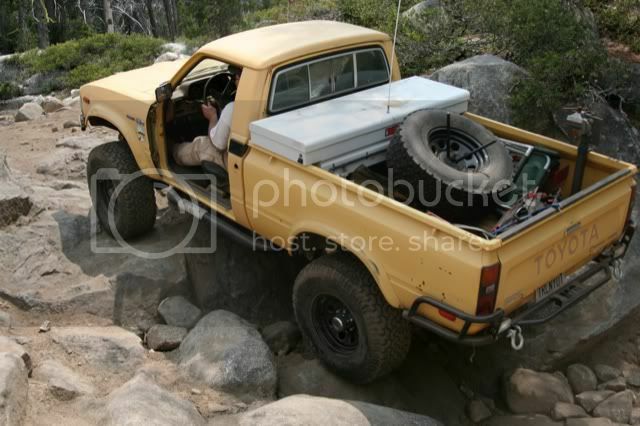 I tried to climb a relatively hard line with too much air in the tires and got so high centered, you almost could spin my Jeep around in a circle. 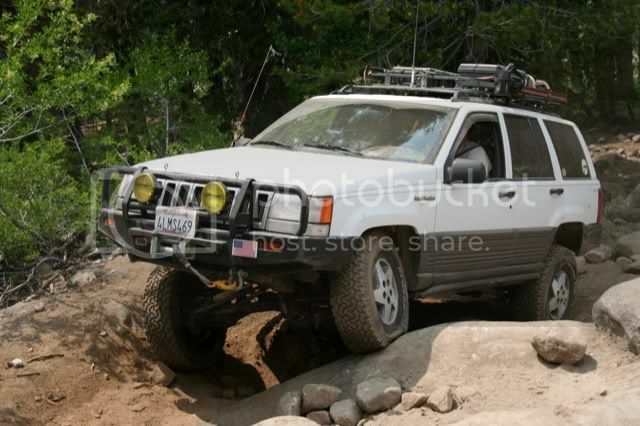 I had to winch myself off the boulder. Everyone else made it up with minor delays in forward progress except for Ed who walked right up it like a driveway. After everyone was on top, I asked if they would mind if I gave it another shot with aired down tires. 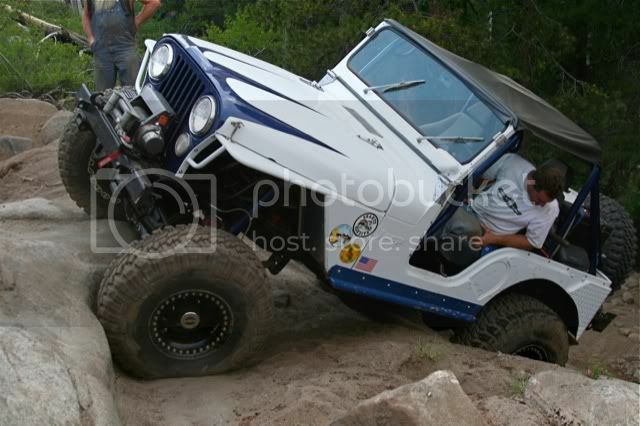 Of course everyone said go for it, because honestly, what 4 wheeler doesn’t like watching someone else try to roll their Jeep. I elected to try a +/- 70% granite wall off to the left side. With Ole as my guide, I made it up with a lot of luck and a heavy right foot. I just could not drive away from that damn stair-steps again with my tail between my legs. Way too much fun for one day, so we headed back to camp. On our way out, we saw Stacie Albright camping near the reservoir. We talked with her for a while and aired up our rigs and headed back to camp for some cold adult beverages. Saturday was also fun. We had more people and cooler weather. There was probably a dozen or so large limbs I moved out of the way before anyone could get out of their rig. Then there were 3-4 very large trees across the trail that we easily pulled out of the way. Luckily all of these large trees fractured when they hit the ground, so they did not need to be cut with a saw. There was only 3 remaining snow drifts on the backside of the trail and only one required some digging to help it melt faster. We moved through the first part of the trail so fast that we had time to take an awesome group photo on the edge of a vista. Thanks to CJ and Tom for shooting some very, very cool photos of everyone and their rigs!! Look for it on the web site soon. After lunch, we traveled the last loop and moved a few more down trees. This trail had not be used in a while and tested everyone’s low gears and brakes. We were back at camp by 4pm and had the rest of the afternoon to kick-back and relax. 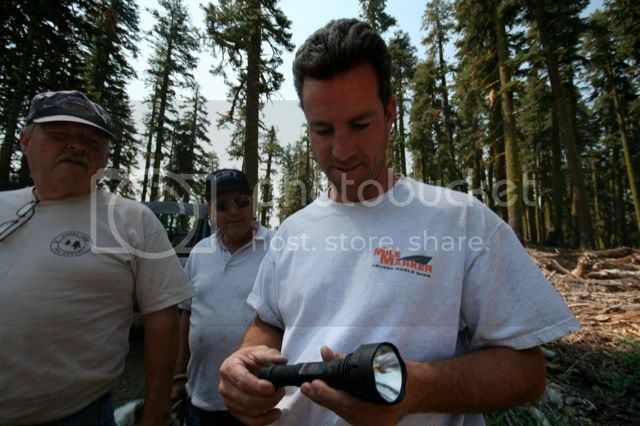 It was great to get out of the smokey Bay Area for a few days and enjoy the great outdoors with fellow 4 wheelers. I am ready to go back! The summer camp out should be a great weekend!! Thanks again to all who participated and made this years Adopt-A-Trail a huge success!!!!!! Friday’s crew: Jason Green; Jay Lohr; Tom Vella; Ed Lorenzen; Chris Mains; Sherry Stortroen; C J Arnesen; Jim Hodges and Ole Stortroen. Saturday’s crew: Chris Mains; Jay Lohr; Jason Green; Tom Vella; Ellen Layendecker; Jim Hodges; Brian McMinn; Thu Doung; Rick & Val Arnesen; C J Arnesen; Loro Paterson; Darell Kroeker; Lynn Warkentin; Bob Atchison; and Sherry Stortroen. 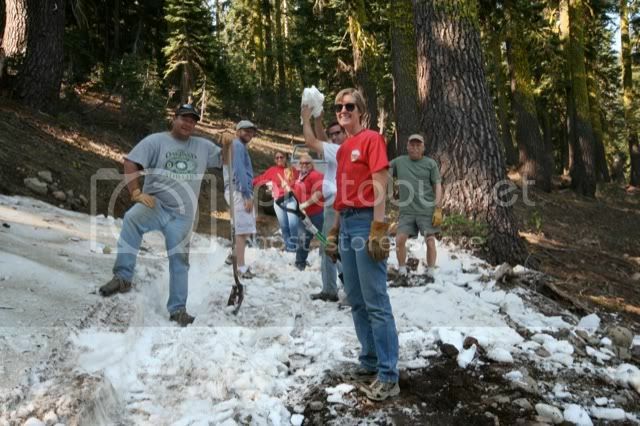 This year our group helped cut and clear 5 downed trees; dig thru one small snow bank; and picked up lots of garbage. 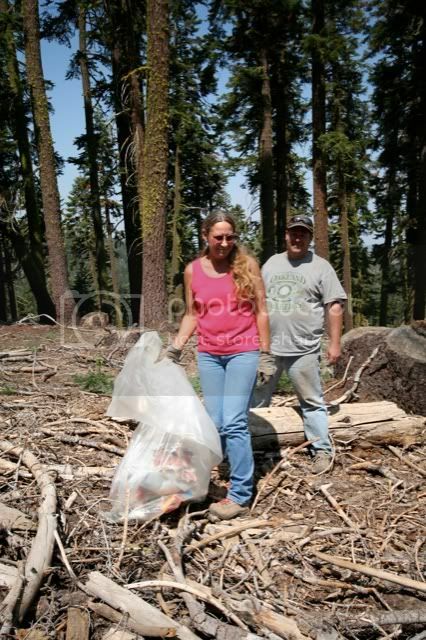 There was an area off the Mattley Loop trail, that we cleaned up lots of garbage, shooting type garbage. After Friday’s work day, Jason lead the group through the Slick Rock Trail. Nice trail, and not getting any easier. It was a nice day with work and wheeling. Thank you Jason for taking lead for the trails.